HomeVETERANSEmbro & West ZorraHill, William Lowrie Jr.
William Lowrie Hill Jr. was born Dec. 21, 1888, son of William and Mary J. (Colgan) Hill of Harrington West. 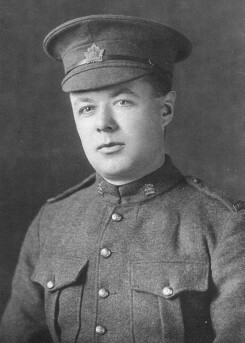 William enlisted with the 49th Battalion, Canadian Infantry, Edmonton, Alberta June 12, 1915, having previously served for three years with the 24th Regiment (Grey’s Horse). Upon enlistment he said he had worked as a waiter. He was missing in action on June 5, 1916, in the battle of Sanctuary Wood and is commemorated on the Menin Gate Memorial, Ypres, Belgium.